33 publications with the keyword "dod"
H. Aliakbarpour, K. Palaniappan, and J. Dias. Geometric exploration of virtual planes in a fusion-based 3D registration framework. Proc. SPIE Conf. Geospatial InfoFusion III (Defense, Security and Sensing: Sensor Data and Information Exploitation), volume 8747, pages 87470C, 2013. Determining the location and orientation of vehicles in satellite and airborne imagery is a challenging task given the density of cars and other vehicles as well as the complexity of the environment in urban regions around the world. 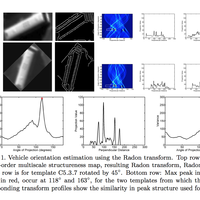 We describe an accurate and flexible method for detecting vehicles using a template-based directional chamfer matching approach, and vehicle orientation estimation using a refined segmentation followed by a novel Radon transform based profile variance peak detection. 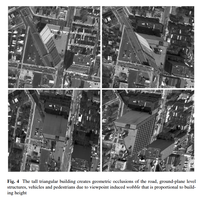 The same algorithm was applied to both high resolution satellite imagery and wide area aerial imagery and initial results show robustness to varying illumination and geometric appearance distortions. Nearly 80% of the orientation angle estimates for 1585 vehicles across both satellite and aerial imagery were accurate to within 15 degrees of the ground truth. In the case of satellite imagery alone, nearly 90% of the objects had an estimated error within ±1.0 degree of the ground truth. R. Pelapur, F. Bunyak, G. Seetharaman, and K. Palaniappan. 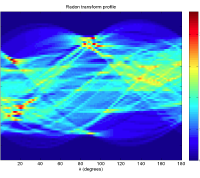 Vehicle detection and orientation estimation using the Radon transform. Proc. SPIE Conf. Geospatial InfoFusion III (Defense, Security and Sensing: Sensor Data and Information Exploitation), volume 8747, pages 87470I, 2013. Current video tracking systems often employ a rich set of intensity, edge, texture, shape and object level features combined with descriptors for appearance modeling. This approach increases tracker robustness but is compu- tationally expensive for realtime applications and localization accuracy can be adversely affected by including distracting features in the feature fusion or object classification processes. This paper explores offline feature subset selection using a filter-based evaluation approach for video tracking to reduce the dimensionality of the feature space and to discover relevant representative lower dimensional subspaces for online tracking. We com- pare the performance of the exhaustive FOCUS algorithm to the sequential heuristic SFFS, SFS and RELIEF feature selection methods. Experiments show that using offline feature selection reduces computational complex- ity, improves feature fusion and is expected to translate into better online tracking performance. 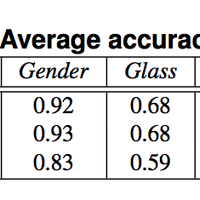 Overall SFFS and SFS perform very well, close to the optimum determined by FOCUS, but RELIEF does not work as well for feature selection in the context of appearance-based object tracking. M. Poostchi, F. Bunyak, and K. Palaniappan. 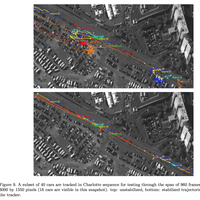 Feature selection for appearance-based vehicle tracking in geospatial video. Proc. SPIE Conf. 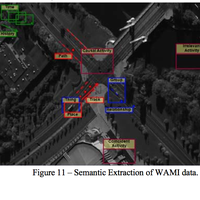 Geospatial InfoFusion III (Defense, Security and Sensing: Sensor Data and Information Exploitation), volume 8747, pages 87470G, 2013. J. Fraser, A. Haridas, G. Seetharaman, R. Rao, and K. Palaniappan. KOLAM: A cross-platform architecture for scalable visualization and tracking in wide-area motion imagery. Proc. SPIE Conf. Geospatial InfoFusion III (Defense, Security and Sensing: Sensor Data and Information Exploitation), volume 8747, pages 87470N, 2013. The integral histogram for images is an efficient preprocess- ing method for speeding up diverse computer vision algorithms including object detection, appearance-based tracking, recognition and segmenta- tion. Our proposed Graphics Processing Unit (GPU) implementation uses parallel prefix sums on row and column histograms in a cross-weave scan with high GPU utilization and communication-aware data transfer between CPU and GPU memories. Two different data structures and communication models were evaluated. A 3-D array to store binned his- tograms for each pixel and an equivalent linearized 1-D array, each with distinctive data movement patterns. Using the 3-D array with many ker- nel invocations and low workload per kernel was inefficient, highlighting the necessity for careful mapping of sequential algorithms onto the GPU. The reorganized 1-D array with a single data transfer to the GPU with high GPU utilization, was 60 times faster than the CPU version for a 1K × 1K image reaching 49 fr/sec and 21 times faster for 512 × 512 images reaching 194 fr/sec. The integral histogram module is applied as part of the likelihood of features tracking (LOFT) system for video object tracking using fusion of multiple cues. keywords = "parallelization, gpu, tracking, fmv, motion, features, dod"
M. Poostchi, K. Palaniappan, F. Bunyak, M. Becchi, and G. Seetharaman. Efficient GPU implementation of the integral histogram. Lecture Notes in Computer Science (ACCV Workshop on Developer-Centered Computer Vision), volume 7728, issue Part I, pages 266--278, 2012. Persistent aerial surveillance is an emerging technology that can provide continuous, wide-area coverage from an aircraft-based multiple-camera system. Tracking targets in these data sets is challenging for vision algorithms due to large data (several terabytes), very low frame rate, changing viewpoint, strong parallax and other imperfections due to registration and projection. Providing an interactive system for automated target tracking also has additional challenges that require online algorithms that are seamlessly integrated with interactive visualization tools to assist the user. We developed an algorithm that overcomes these challenges and demonstrated it on data obtained from a wide-area imaging platform. keywords = "wami, tracking, fmv, features, motion, fusion, dod"
I. Ersoy, K. Palaniappan, G. Seetharaman, and R. Rao. Interactive tracking for persistent wide-area surveillance. Proc. SPIE Conf. Geospatial InfoFusion II (Defense, Security and Sensing: Sensor Data and Information Exploitation), volume 8396, 2012. Aerial wide-area monitoring and tracking using multi-camera arrays poses unique challenges compared to stan- dard full motion video analysis due to low frame rate sampling, accurate registration due to platform motion, low resolution targets, limited image contrast, static and dynamic parallax occlusions.1–3 We have developed a low frame rate tracking system that fuses a rich set of intensity, texture and shape features, which enables adaptation of the tracker to dynamic environment changes and target appearance variabilities. However, improper fusion and overweighting of low quality features can adversely affect target localization and reduce tracking performance. 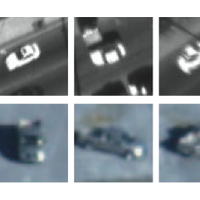 Moreover, the large computational cost associated with extracting a large number of image-based feature sets will influence tradeoffs for real-time and on-board tracking. This paper presents a framework for dynamic online ranking-based feature evaluation and fusion in aerial wide-area tracking. We describe a set of efficient descriptors suitable for small sized targets in aerial video based on intensity, texture, and shape feature representations or views. Feature ranking is then used as a selection procedure where target-background discrimination power for each (raw) feature view is scored using a two-class variance ratio approach. A subset of the k-best discriminative features are selected for further processing and fusion. The target match probability or likelihood maps for each of the k features are estimated by comparing target descriptors within a search region using a sliding win- dow approach. The resulting k likelihood maps are fused for target localization using the normalized variance ratio weights. We quantitatively measure the performance of the proposed system using ground-truth tracks within the framework of our tracking evaluation test-bed that incorporates various performance metrics. The proposed feature ranking and fusion approach increases localization accuracy by reducing multimodal effects due to low quality features or background clutter. Adaptive feature ranking increases the robustness of the tracker in dynamically changing environments especially when the object appearance is changing. S. Candemir, K. Palaniappan, F. Bunyak, and G. Seetharaman. 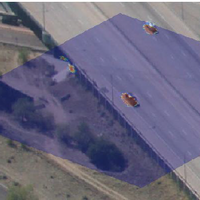 Feature fusion using ranking for object tracking in aerial imagery. Proc. SPIE Conf. Geospatial InfoFusion II (Defense, Security and Sensing: Sensor Data and Information Exploitation), volume 8396, 2012. In this paper, we present a tracking method with robust target local- ization for tracking of visual objects. We use an adaptive appearance model that incorporates structural information to avoid drifts and can be updated incrementally using partial models. The proposed method works especially well for aerial surveillance sequences where the objects of interest are small and detecting robust fea- ture points in a repeatable manner is difficult due to scale, blur and changing viewpoints. We compare our method using standard sequences and show results on aerial video sequences including wide-area motion imagery (WAMI). keywords = "wami, tracking, fmv, features, motion, dod"
I. Ersoy, K. Palaniappan, and G. Seetharaman. Visual tracking with robust target localization. IEEE Int. Conf. 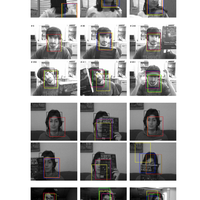 Image Processing, pages 1365--1368, 2012. Visual feature-based tracking systems need to adapt to variations in the appearance of an object and in the scene for robust performance. Though these variations may be small for short time steps, they can accumu- late over time and deteriorate the quality of the match- ing process across longer intervals. Tracking in aerial imagery can be challenging as viewing geometry, cal- ibration inaccuracies, complex flight paths and back- ground changes combined with illumination changes, and occlusions can result in rapid appearance change of objects. Balancing appearance adaptation with sta- bility to avoid tracking non-target objects can lead to longer tracks which is an indicator of tracker robust- ness. The approach described in this paper can han- dle affine changes such as rotation by explicit orien- tation estimation, scale changes by using a multiscale Hessian edge detector and drift correction by using seg- mentation. We propose an appearance update approach that handles the ‘drifting’ problem using this adaptive scheme within a tracking environment that is comprised of a rich feature set and a motion model. R. Pelapur, K. Palaniappan, and G. Seetharaman. Robust orientation and appearance adaptation for wide-area large format video object tracking. 9th IEEE Int. Conf. Advanced Video and Signal-Based Surveillance, 2012. 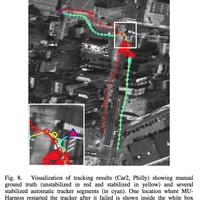 Vehicle tracking using airborne wide-area motion imagery (WAMI) for monitoring urban environments is very challenging for current state-of-the-art tracking algorithms, com- pared to object tracking in full motion video (FMV). 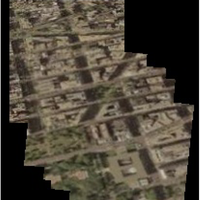 Character- istics that constrain performance in WAMI to relatively short tracks range from the limitations of the camera sensor array including low frame rate and georegistration inaccuracies, to small target support size, presence of numerous shadows and occlusions from buildings, continuously changing vantage point of the platform, presence of distractors and clutter among other confounding factors. We describe our Likelihood of Features Tracking (LoFT) system that is based on fusing multiple sources of information about the target and its environment akin to a track-before-detect approach. LoFT uses image-based feature likelihood maps derived from a template-based target model, object and motion saliency, track prediction and management, combined with a novel adaptive appearance target update model. Quantitative measures of performance are presented using a set of manually marked objects in both WAMI, namely Columbus Large Image Format (CLIF), and several standard FMV se- quences. Comparison with a number of single object tracking systems shows that LoFT outperforms other visual trackers, including state-of-the-art sparse representation and learning based methods, by a significant amount on the CLIF sequences and is competitive on FMV sequences. R. Pelapur, S. Candemir, F. Bunyak, M. Poostchi, G. Seetharaman, and K. Palaniappan. Persistent target tracking using likelihood fusion in wide-area and full motion video sequences. 15th Int. Conf. Information Fusion, pages 2420--2427, 2012. 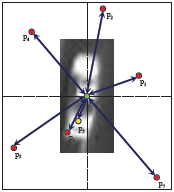 Motion detection using background modeling is a widely used technique in object tracking. To meet the demands of real-time multi-target tracking applications in large and/or high resolution imagery fast parallel algorithms for motion detection are desirable. One common method for back- ground modeling is to use an adaptive 3D median filter that is updated appropriately based on the video sequence. We describe a parallel 3D spatiotemporal median filter al- gorithm implemented in CUDA for many core Graphics Pro- cessing Unit (GPU) architectures using the integral histogram as a building block to support adaptive window sizes. Both 2D and 3D median filters are also widely used in many other computer vision tasks like denoising, segmentation, and recognition. 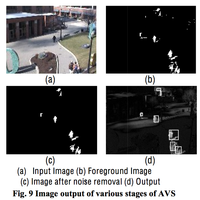 Although fast sequential median algorithms exist, improving performance using parallelization is attrac- tive to reduce the time needed for motion detection in order to support more complex processing in multi-target tracking systems, large high resolution aerial video imagery and 3D volumetric processing. Results show the frame rate of the GPU implementation was 60 times faster than the CPU ver- sion for a 1K × 1K image reaching 49 fr/sec and 21 times faster for 512 × 512 frame sizes reaching 194 fr/sec. We characterize performance of the parallel 3D median filter for different image sizes and varying number of histogram bins and show selected results for motion detection. M. Poostchi, K. Palaniappan, F. Bunyak, M. Becchi, and G. Seetharaman. 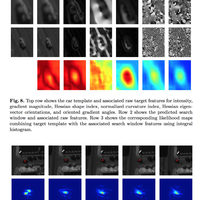 Realtime motion detection based on the spatio-temporal median filter using GPU integral histograms. 8th Indian Conference on Computer Vision, Graphics and Image Processing, 2012. The need for persistent video covering large geospatial areas using embedded camera networks and stand-off sensors has increased over the past decade. The availability of inexpensive, compact, light-weight, energy-efficient, high resolution optical sensors and associated digital image processing hardware has led to a new class of airborne surveillance platforms. Traditional tradeoffs posed between lens size and resolution, that is the numerical aperture of the system, can now be mitigated using an array of cameras mounted in a specific geometry. This fundamental advancement enables new imaging systems to cover very large fields of view at high resolution, albeit with spatially varying point spread functions. Airborne imaging systems capable of acquiring 88 megapixels per frame, over a wide field-of-view of 160 degrees or more at low frame rates of several hertz along with color sampling have been built using an optical array with up to eight cameras. These platforms fitted with accurate orientation sensors circle above an area of interest at constant altitude, adjusting steadily the orientation of the camera array fixed around a narrow area of interest, ideally locked to a point on the ground. The resulting image sequence maintains a persistent observation of an extended geographical area depending on the altitude of the platform and the configuration of the camera array. Suitably geo-registering and stabilizing these very large format videos provide a virtual nadir view of the region being monitored enabling a new class of urban scale activity analysis applications. The sensor geometry, processing challenges and scene interpretation complexities are highlighted. K. Palaniappan, R. Rao, and G. Seetharaman. Wide-area persistent airborne video: Architecture and challenges. Distributed Video Sensor Networks: Research Challenges and Future Directions, Springer, pages 349--371, 2011. The integral histogram is a recently proposed preprocessing technique to compute histograms of arbitrary rectangular gridded (i.e. image or volume) regions in constant time. We formulate a general parallel version of the the integral histogram and analyse its implementation in Star Superscalar (StarSs). StarSs provides a uniform programming and runtime environment and facilitates the development of portable code for heterogeneous parallel architectures. In particular, we discuss the implementation for the multi-core IBM Cell Broadband Engine (Cell/B.E.) and provide extensive performance measurements and tradeoffs using two different scan orders or histogram propagation methods. For 640×480 images, a tile or block size of 28×28 and 16 histogram bins the parallel algorithm is able to reach greater than real-time performance of more than 200 frames per second. P. Bellens, K. Palaniappan, R. M. Badia, G. Seetharaman, and J. Labarta. Parallel implementation of the integral histogram. Lecture Notes in Computer Science (ACIVS), volume 6915, pages 586--598, 2011. 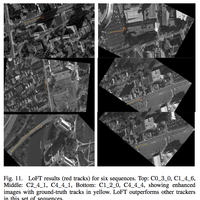 The task of automated object tracking and performance assessment in low frame rate, persistent, wide spatial coverage motion imagery is an emerging research domain. The collection of hundreds to tens of thousands of dense trajectories produced by such automatic algorithms along with the subset of manually verified tracks across several coordinate systems require new tools for effective human computer interfaces and exploratory trajectory visualization. We describe an interactive visualization system that supports very large gig pixel per frame video, facilitates rapid, intuitive monitoring and analysis of tracking algorithm execution, provides visual methods for the inter comparison of very long manual tracks with multi segmented automatic tracker outputs, and a flexible KOLAM Tracking Simulator (KOLAM-TS) middleware that generates visualization data by automating the object tracker performance testing and benchmarking process. A. Haridas, R. Pelapur, J. Fraser, F. Bunyak, and K. Palaniappan. 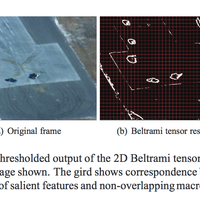 Visualization of automated and manual trajectories in wide-area motion imagery. 15th Int. Conf. Information Visualization, pages 288--293, 2011. The flux tensor motion flow algorithm is a versatile computer vision technique for robustly detecting moving objects in cluttered scenes. The flux tensor calculation has a high computational workload consisting of 3-D spatiotemporal filtering operations combined with 3-D weighted integration operations for estimating local averages of the flux tensor matrix trace. In order to achieve efficient real-time processing of high bandwidth video streams a data parallel multicore algorithm was developed for the Cell Broadband Engine (Cell/B.E.) processor and evaluated in terms of the energy to computation efficiency compared to a fast sequential CPU implementation. Our multicore implementation is 12 to 40 times faster than the sequential version for HD video using a single PS-3 Cell/B.E. processor and is faster than realtime for a range of filter configurations and video frame sizes. We report on the power efficiency measured in terms of performance per watt for the Cell/B.E. implementation which is at least 50 times better than the sequential version. K. Palaniappan, I. Ersoy, G. Seetharaman, S. Davis, P. Kumar, R. M. Rao, and R. Linderman. 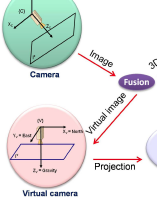 Parallel flux tensor analysis for efficient moving object detection. 14th Int. Conf. Information Fusion, 2011. 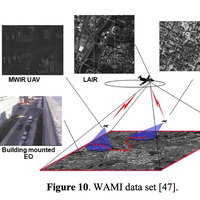 Very large format video or wide-area motion imagery (WAMI) acquired by an airborne camera sensor array is characterized by persistent observation over a large field-of-view with high spatial resolution but low frame rates (i.e. one to ten frames per second). Current WAMI sensors have sufficient coverage and resolution to track vehicles for many hours using just a single airborne platform. We have developed an interactive low frame rate tracking system based on a derived rich set of features for vehicle detection using appearance modeling combined with saliency estimation and motion prediction. Instead of applying subspace methods to very high-dimensional feature vectors, we tested the performance of feature fusion to locate the target of interest within the prediction window. 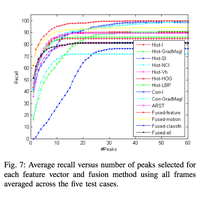 Preliminary results show that fusing the feature likelihood maps improves detection but fusing feature maps combined with saliency information actually degrades performance. K. Palaniappan, F. Bunyak, P. Kumar, I. Ersoy, S. Jaeger, K. Ganguli, A. Haridas, J. Fraser, R. Rao, and G. Seetharaman. 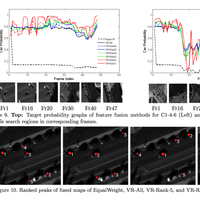 Efficient feature extraction and likelihood fusion for vehicle tracking in low frame rate airborne video. 13th Int. Conf. Information Fusion, 2010. The flux tensor motion flow algorithm is a versatile computer vision technique for robustly detecting moving objects in clut- tered scenes. The flux tensor calculation has a high compu- tational workload consisting of 3-D spatiotemporal filtering operations combined with 3-D weighted integration opera- tions for estimating local averages of the flux tensor matrix trace. In order to achieve efficient real-time processing of high bandwidth video streams a data parallel multicore al- gorithm was developed for the Cell Broadband Engine (BE) processor and evaluated in terms of the energy to computa- tion efficiency compared to a fast sequential CPU implemen- tation. Our multicore implementation is 12 to 40 times faster than the sequential version for HD video using a single PS-3 Cell/B.E. processor and is faster than realtime for a range of filter configurations and video frame sizes. We report on the power efficiency measured in terms of performance per watt for the Cell/B.E. implementation which is 50 to 160 times better than the sequential version for HD video depending on the filter size. The results suggest an additional strategy to trade off output image quality or nominal change in accuracy of detection for improved energy efficiency in suitable envi- ronments. K. Palaniappan, I. Ersoy, G. Seetharaman, S. Davis, R. Rao, and R. Linderman. 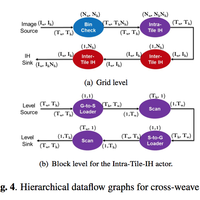 Multicore energy efficient flux tensor for video analysis. IEEE Workshop on Energy Efficient High-Performance Computing (EEHiPC), 2010.
keywords = "wami, tracking, fmv, registration, motion, fusion, dod"
The rapid increase in pixel density and frame rates of mod- ern imaging sensors is accelerating the demand for fine-grained and em- bedded parallelization strategies to achieve real-time implementations for video analysis. The IBM Cell Broadband Engine (BE) processor has an appealing multi-core chip architecture with multiple programming models suitable for accelerating multimedia and vector processing appli- cations. 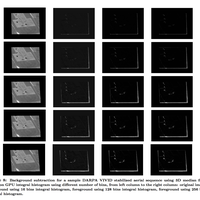 This paper describes two parallel algorithms for blob extraction in video sequences: binary morphological operations and connected com- ponents labeling (CCL), both optimized for the Cell-BE processor. 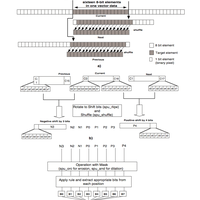 Novel parallelization and explicit instruction level optimization techniques are described for fully exploiting the computational capacity of the Syner- gistic Processing Elements (SPEs) on the Cell processor. Experimental results show significant speedups ranging from a factor of nearly 300 for binary morphology to a factor of 8 for CCL in comparison to equivalent sequential implementations applied to High Definition (HD) video. P. Kumar, K. Palaniappan, A. Mittal, and G. Seetharaman. Parallel blob extraction using the multi-core Cell processor. Lecture Notes in Computer Science (ACIVS), volume 5807, pages 320--332, 2009. At present high-end workstations and clusters are the commonly used hardware for the problem of real-time video surveillance. Through this paper we propose a real time framework for a 640×480 frame size at 30 frames per second (fps) on a low costing graphics processing unit ( GPU ) ( GeForce 8400 GS ) which comes with many low-end laptops and personal desk- -tops. 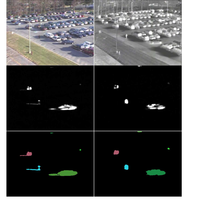 The processing of surveillance video is computationally intensive and involves algorithms like Gaussian Mixture Model (GMM), Morphological Image operations and Connected Component Labeling (CCL). The challenges faced in parallelizing Automated Video Surveillance (AVS) were: (i) Previous work had shown difficulty in parallelizing CCL on CUDA due to the dependencies between sub- blocks while merging (ii) The overhead due to a large number of memory transfers, reduces the speedup obtained by parallelization. We present an innovative parallel implementation of the CCL algorithm, overcoming the problem of merging. The algorithms scale well for small as well as large image sizes. We have optimized the implementations for the above mentioned algorithms and achieved speedups of 10X, 260X and 11X for GMM, Morphological image operations and CCL respectively, as compared to the serial implementation, on the GeForce GTX 280. S. Mehta, A. Misra, A. Singhal, P. Kumar, A. Mittal, and K. Palaniappan. 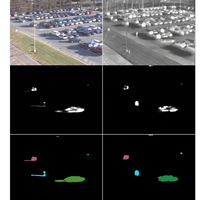 Parallel implementation of video surveillance algorithms on GPU architectures using CUDA. 17th IEEE Int. Conf. Advanced Computing and Communications (ADCOM), 2009. We present a new approach aimed at fast multiframe registra- tion of airborne video collected by moving platforms such as unmanned aerial vehicles. Registration is used to enable sep- arating the moving objects from the stationary background, which is similar to estimating the egomotion of the sensor. The proposed registration algorithm is used to match the mov- ing background and remap video frames into a common co- ordinate system in order to stabilize that segment of video. 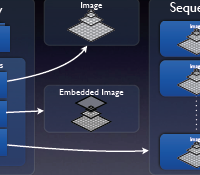 The major modules include dense feature detection, sparse prominent edge and corner-based feature block identification, feature block region matching to extract control points, con- fidence weighted robust projective transformation estimation and image warping to register a segment of frames within a given temporal window. The proposed method is shown to produce good results with small image registration error. A. Hafiane, K. Palaniappan, and G. Seetharaman. UAV-Video registration using block-based features. IEEE Int. Geoscience and Remote Sensing Symposium, volume II, pages 1104-1107, 2008. This paper evaluates performance of the dynamically instruction scheduled VLIW (DISVLIW) processor architecture. The DISVLIW processor architecture is designed for dynamically scheduling VLIW instructions using dependency information. Features such as explicit parallelism, balanced scheduling effort, and dynamic scheduling of VLIW instructions can be used to provide a sound structure for supercomputing. We simulate the DISVLIW processor architecture and show that the DISVLIW processor performs significantly better than the VLIW processor across various numerical benchmark applications. S.-H. Jee and K. Palaniappan. 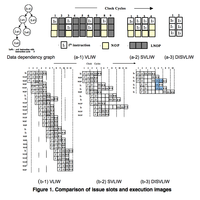 Performance of dynamically scheduling VLIW instructions. IEEE Int. Symp. System-on-Chip, pages 7--10, 2003. The Dynamically Instruction Scheduled VLIW (DISVLIW) processor architecture is designed for balancing scheduling effort more evenly between the compiler and the processor. The DISVLIW instruction format is augmented to allow dependency bit vectors to be placed in the same VLIW word. Dependency bit vectors are added to each instruction format within long instructions to enable synchronization between prior and subsequent instructions. The DISVLIW processor dynamically schedules each instruction in long instructions using functional unit and dynamic scheduler pairs. Each dynamic scheduler dynamically checks for data dependencies and resource collisions while scheduling each instruction. Features such as explicit parallelism, balanced scheduling effort, and dynamic scheduling can be used to provide a sound frastructure for supercomputing. We simulate the DISVLIW architecture and show that the DISVLIW processor performs significantly better than the VLIW processor for a wide range of cache sizes and across numerical benchmark applications. S.-H. Jee and K. Palaniappan. Compiler processor tradeoffs for DISVLIW architectures. IEEE Int. Symp. On Parallel Architectures, Algorithms, and Networks (ISPAN), pages 175--180, 2002. 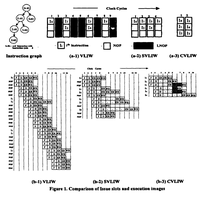 This paper presents a new ILP processor architecture called Compressed VLIW (CVLIW). The CVLIW processor constructs a sequence of long instructions by removing nearly all NOPs (No OPerations) and LNOPs (Long NOPs) from VLIW code. The CVLIW processor individually schedules each instruction within long instructions using functional unit and dynamic scheduler pairs. Every dynamic scheduler in the CVLIW processor individually checks for data dependencies and resource collisions while scheduling each instruction. 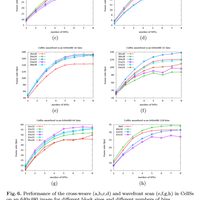 In this paper, we simulate the architecture and show that the CVLIW processor performs better than the VLIW processor for a wide range of cache sizes and across various numerical benchmark applications. These performance gains of the CVLIW processor result from individual instruction scheduling and size reduction of object code. Even though we assume a cache with a zero miss rate, the CVLIW's performance is still 9%~15% higher than that of the VLIW processor regardless of benchmark applications. S.-H. Jee and K. Palaniappan. 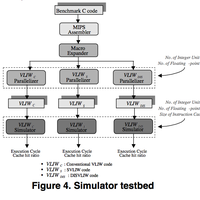 Performance analysis for a compressed-VLIW processor. ACM Symp. on Applied Computing, pages 913--917, 2002. This paper proposes balancing scheduling effort more evenly between the compiler and the processor, by introducing dynamically scheduled Very Long Instruction Word (VLIW) instructions. Dynamically Instruction Scheduled VLIW (DISVLIW) processor is aimed specifically at dynamic scheduling VLIW instructions with dependency information. The DISVLIW processor dynamically schedules each instruction within long instructions using functional unit and dynamic scheduler pairs. Every dynamic scheduler dynamically checks for data dependencies and resource collisions while scheduling each instruction. This scheduling is especially effective in applications containing loops. We simulate the architecture and show that the DISVLIW processor performs significantly better than the VLIW processor for a wide range of cache sizes and across various numerical benchmark applications. S.-H. Jee and K. Palaniappan. 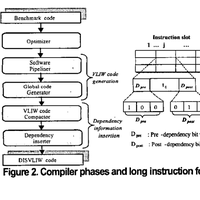 Dynamically scheduling VLIW instructions with dependency information. 8th IEEE Int. Symp. On High-Performance Computer Architecture and 6th Workshop on Interaction Between Compilers and Computer Architectures, pages 15--23, 2002. 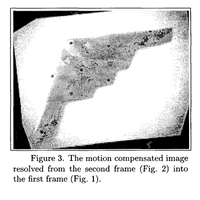 A piecewise-affine image registration method is proposed to compute the displacement field in an im- age sequence of an aerodynamic object experiencing heavy winds in a wind tunnel. Our method is use- ful for tracking objects whose net 3-D motion is fully characterized by a non-rigid motion and a significant component that is common to all parts of the object. A set of control points have been introduced on the ob- ject surface to help divide each image into a set of tri- angles and enable tracking each triangular area. The computed velocity field is piecewise affine for each tri- angle and is continuous across the boundary between any two adjacent triangles. Of interest is the accuracy of the registration process, and its estimate based on local moments and shape distortion that can be com- puted from the original image and the motion compen- sated version of its registered pair. The method has been applied to several images and the experimental results are presented. G. Seetharaman, G. Gasperas, and K. Palaniappan. A piecewise affine model for image registration in nonrigid motion analysis. IEEE Int. Conf. Image Processing, volume 1, pages 561--564, 2000.